The Pokemon craze hasn’t faded and the Pokemon Pikachu Bowtie is just the fashion accessory you need to spruce up your street style while on the hunt! 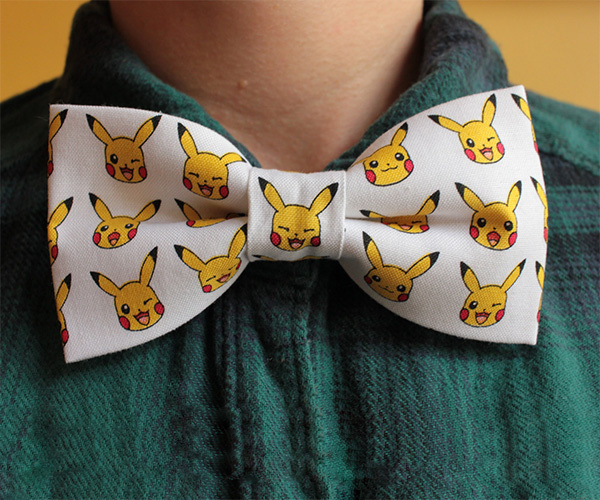 This handmade bowtie has our favourite Pokemon Pikachu all over on a white background. Each Bowtie is sewn with an adjustable white elastic band so you have to simply slip it under your colour. For all the ladies wanting some Pikachu fashion accessories, this can also be made into a hair bow with an attached hair clip. Measuring 12cm by 6cm, it makes the perfect Pokemon gift, or the perfect Pokemon accessory and gift for a Poke-Fan!